Update, 2016 - Bradford Exchange, who distributes the Hawthorne Village products shown on this page has recently been forced by the attorney generals of several states (including Ohio where I live) to stop letting folks in Ohio and other states recommend products we like. If we keep it up, Bradford Exchange will have to start collecting sales tax for any customers in those states who order from them. So they have sent out an e-mail asking me (and hundreds of other people) to cease and desist recommending products we like. It will take us a while to get things on these pages reconfigured to reflect the new requirements, but in the meantime, please consider the rest of this page an archive of past recommendations, for informational purposes only. We would never dream of continuing to recommend Hawthorne Village products that we liked in 2014 and still think highly of! Note About Team-Inspired Villages - When demand for a particular team's memorabilia is high, Hawthorne Village may issue additional collections inspired by the team. The most common is a "Christmas-village"-style village collection that includes stadiums, other buildings, miniature fans, and other accessories - everything you need to build a "team town" your railroad can serve. The NFL-inspired villages can all be accessed by clicking on the picture to the right. 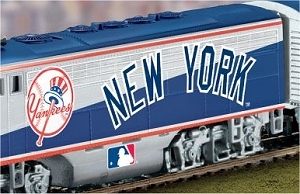 Unfortunately, most of the baseball "team villages" are now out of stock. 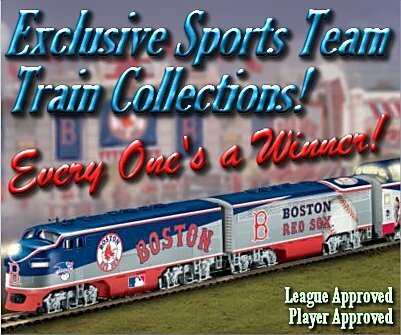 As of February, 2013, the only ones I can find are the Cardinals , Mets , Yankees , White Sox , and Red Sox . But if you order a train, stay on Bradford Exchange long enough to see if there is a village that will go with it. Just remember, these are limited editions, so if you see a village that goes with your train, don't wait too long to decide if you want it.